From the 1st to the 6th January 2019, the Polstjärnepriset Vänersborg Competition took place in Sweden. This special contest is dedicated to young people aged 14 – 18 who play a classic instrument. During the Polar Star Days, participants have been prepared and taught through individual lessons and recitals with other competitors. The jury has then selected eight deserving musicians that have qualified for sub-finals, meanwhile the other players continued to receive lessons and feedback from the jury members. With the accompaniment of the Gothenburg Symphony Orchestra and the conductor Rumon Gamba, the event became a real experience for both the contestants and the large audience. ‘’It has been great fun and inspiring to listen to so much talent. 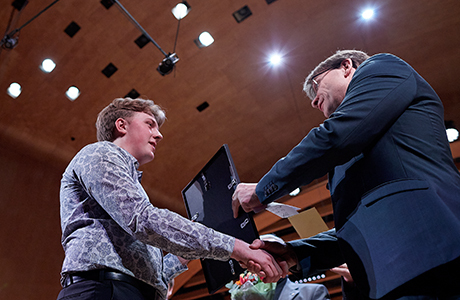 You are all the winners’’, said jury chairman Sten Cranner from the stage. The jury then had the difficult task of ranking the contestants, but after careful consideration, the outcome of the jury chairman was presented. 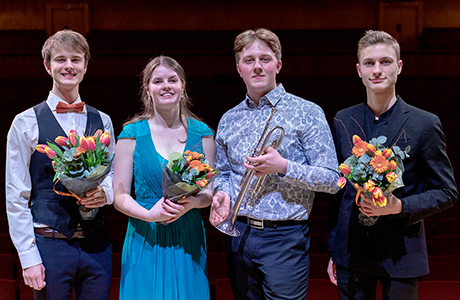 The winner of the Polar Star Award 2019 and the EMCY Prize is Ture Herrgårdh, 18 years old, Mjölby, trumpet. He performed Henri Tomasi, Trumpet concert movement 1. “A very beautiful tone and highly developed technical level on its instrument. He shows a mature and reflected music performance with an impressive, focused scene presence. A very worthy winner. “, one of the jury said. In addition to the event itself , the concert offered a performance by last year’s winner, harpist Johanna Ander Ljung, who started the evening playing Cloches sous la neige from Suite d’images no. 4 by M. Tournier. After the break, Polstjärne Prize Symphony Orchestra played Strata, version for soloists and orchestra by R. Davidson. Soloists: Mira Foron, violin, Noah Hofvander, soprano saxophone, Kristin Pas, viola, Amalie Thing Helseth, cello, Jonas Olsson, piano. Jupiter from the Planets by G Holst was then performed jointly with the Gothenburg Symphony Orchestra under the direction of the youngsters’ conductor Andreas P. Hansson. You can listen to Ture Herrgårdh, Astrid Hillerud, Josef Wijk and Harald Edin’s competition entries accompanied by the Swedish National Orchestra Gothenburg Symphony here.